Judge Donald Dean Haley, 85, created a vast civil-rights and legal legacy, starting a law firm, founding a bar association, being appointed to the King County Superior Court bench and serving as president of the Seattle-King County NAACP chapter. With his eyes set on higher education, Donald Dean Haley left for Washington state after graduating first in his class from a segregated high school in Louisiana. His family helped support him during college by working on a sharecropping plantation. While briefly living with a cousin in Seattle, he attended the University of Washington, where he earned a bachelor’s degree in political science. He worked as a riveter for Boeing to help pay his way through UW School of Law, where he graduated in 1958. 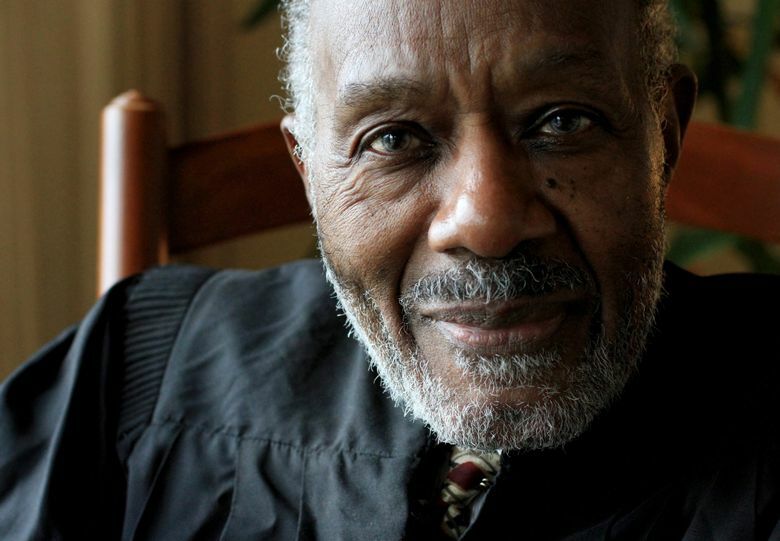 By the time he died of natural causes on July 30, Judge Haley, 85, had created a vast civil-rights and legal legacy that resonates in Seattle. He started his own law firm, founded a bar association, was appointed to the King County Superior Court bench and served as president of the Seattle-King County NAACP chapter. As word spread about Judge Haley’s death, Superior Court judges shared memories of their former colleague. Some recalled meeting him when they first arrived to the courthouse as rookies, others when he sought re-election to the bench in 2000. “Judge Haley was a true gentleman,” wrote Judge John P. Erlick in an email thread. Erlick and Judge Dean Lum recalled that even after they became judges, they couldn’t bring themselves to call Judge Haley by his first name despite his insistence. They had too much respect for him. Judge Haley served on King County Superior Court from 1983 until his retirement in 2002. Co-workers described him as an easygoing, graceful man with a self-deprecating sense of humor. His son, Byron Haley, and his son’s wife, Janice Jackson-Haley, remembered Judge Haley as a stickler for details. They chuckled when they recalled his famous smoked turkey, cooked perfectly year after year. Erlick said Judge Haley’s experience with segregation in the South instilled in him a sense of justice, one that propelled him in his education and career. Over the years, Erlick said, Judge Haley shared with him how, as a child, he had picked cotton and had to use different buses and drinking fountains than white people. Before being appointed to the Superior Court bench, Judge Haley was an administrative judge for the state’s Board of Industrial Insurance Appeals and launched a law firm with three other attorneys. In 2013, Judge Haley told a Seattle Times reporter that white law firms never used to hire black attorneys. He also recounted the time a UW adviser summed up his intention to become a political-science graduate as an excuse to boss white people around. When Judge Haley decided to go to law school, the adviser wanted him back for graduate work in political science. Judge Haley said no. Judge Haley was NAACP president for the Seattle-King County chapter from 1969 to 1972, and continued on as a member for decades. He was also one of the original founders of the Loren Miller Bar Association (LMBA), a civil-rights-focused nonprofit which, among many other activities, helped advance equity for UW African-American student athletes. LMBA President Erika Evans, 28, said she first met Judge Haley when she was a 22-year-old law student at Seattle University. Evans said Judge Haley went to every meeting, event and LMBA gathering and was the LMBA Foundation president up until his death last month. The foundation provided scholarships to help aspiring African-American lawyers pay for their bar exams. “As he was assisted by mentors along the way, he turned back to reach and help others,” she said. Judge Haley’s memorial will take place at 11 a.m. Thursday, Aug. 30, at the Peoples Institutional Baptist Church, 159 24th Ave., Seattle. Byron Haley said his father’s death hit the family hard, delaying the planning for his service. In addition to his son, Judge Haley is survived by his wife of 65 years, Margaret Geyen, and two granddaughters, Maya and Brittney. In lieu of flowers, Judge Haley’s family is requesting donations be made to the Loren Miller Bar Association, P.O. Box 1873, Seattle, WA 98111.